Bring your dog to the beach and have THE BEST time this summer! 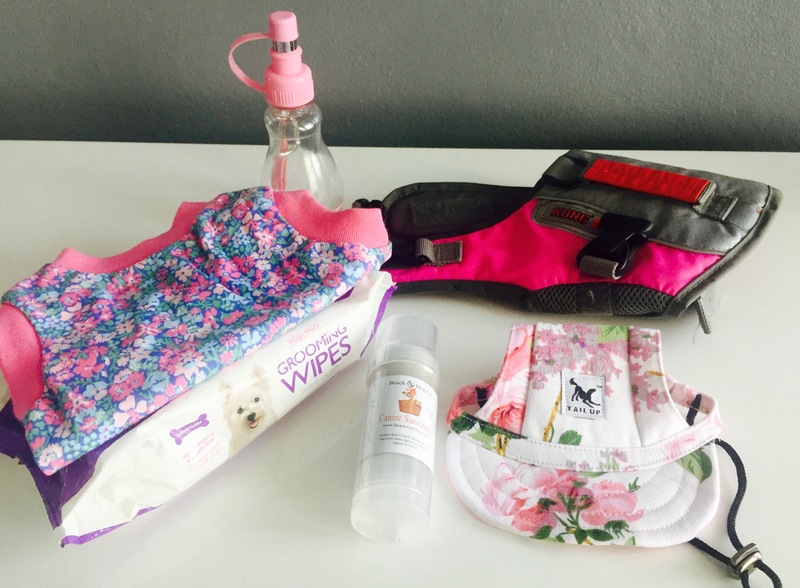 Depending on your dog’s breed and habits, you will need to pack some dog’s beach bag essentials to ensure everyone has a blast. For me, having my little beast whenever we go to the beach is so much fun. She looks all crazy absorbing all at once: new people, kids ((IKR, she loves them! )), sand & ahhh the water! 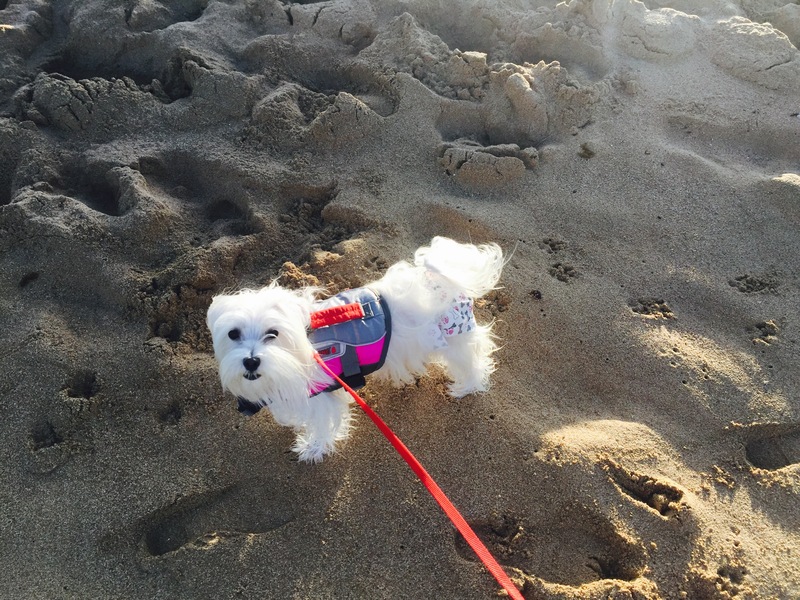 But my doggie is a Maltese so I need to be very careful with her dog’s beach bag for those kind of outings. Because of her white hair, sensitive skin and loooong – thin hair, we take some precautions. If you have a Spaniel or a Retriever… those are the best breeds to take for beach walks and all sort of water outings. Although, you always gonna need some essentials! So, what to pack in your dog’s beach bag? Because I had so much trouble finding the right items for my little beast and had to do a lot of research, I thought it’s a good idea to share my results for anyone who has the same struggles as I did. To make it easier, I divided this list by categories: Health & Safety, Hygiene, Fun! & added links to show you specific items I recommend! It’s king of obvious, as the beach is hot and your doggie will be running around. But, believe me, some people forget thinking that the doggie can drink beach water. And let me tell you… it’s dangerous if you let them drink to much; they can dehydrate fast! So, please! Bring fresh water and keep it accessible at all times! I like to bring a with a nozzle, because it prevents water to get dirty or sandy. Also, she loves ice cubes!! Again, this is kind of obvious but easy to forget! I put on my little beast at least 15 minutes before sun exposure and I reapply as needed. I also have a bathing suit for her and put it on when she does not have her vest on to protect her skin even more. With the latter, I keep her wet and refreshed as the clothing could lead to overheat if you are not careful. Most of the doggies out there know how to swim properly, it’s like in their DNA. But, keep in mind they are going to be actively playing and if there are waves they can get tired. Bring a and keep it on them when they are in the water. I alternate my activities and bring her out of the water every 20 minutes or less. When she is out of the water most of the time, I remove the life jacket to let her me more comfortable. Don’t forget to keep her identified at all times with a and a plaque that have your contact info on. The only times I skip this is when I know for certain, she is gonna be only with me ((in her case, never without a leash – I keep several)) and when the beach is isolated. Because, as you can imagine she is crazy sociable and some people love it when cute doggies approach, but not always and one must be considerate. IKR… she looks so cute with her hat on! Every time I put her on, she is the center of attention in the beach! My hubby doesn’t like the extra attention, as you can imagine haha 😉 Although you will be resting covered up by an umbrella, keep in mind that on sunny days, their eyes can be hurt and of course their heads & nose also get sunburn if you don’t pay special attention and cover them up. I bring for the possibility of any cuts and eye drops just in case any sand or particle in her eyes. Never in two years had to use them, but you need to be prepared. With the risk of sounding as if I have a kid, really, how convenient are those !!! Maybe I’m a freak, weirdo, crazy about keeping everything neat, but I need them to keep my mental peace in case my little beast do some disaster with food or anything else. She is a savage sometimes! Due to her long & thin hair, this little beast have a to ensure she is almost if not completely dry when we arrive to the car. Also, a for frizz-free hair! I always rinse her with fresh water after swimming ((this is also due to her sensitive skin, but highly recommended for any doggie)). Always needed and the beach is no exception. Enough said! People tend to forget that you need to keep spaces clean, especially out there in public spaces, with people that not necessarily like having dogs around for that particular reason. Please, be kind, considerate and help communities see that we can behave civilised so that many more places accept doggies; bring your ! Bring that you can store in the cooler and keep them cold without compromising quality. For my little beast, anything I give her to eat or drink will be cold in the beach, so she can feel fresher. Don’t forget some water toys to make the day interactive and more fun for your doggie & you! My little beast loves retrieving ((in the water)) and playing ((outside of water)). I bring both to keep us having fun whenever we are! That’s it! At least the essentials for a fun day at the beach with your doggie & family!! Hope you liked it! Do you bring something else in your Dog’s Beach Bag?